Facebook is rolling out two new features that appear to be a direct reaction to Google+ (and to a lesser degree Twitter). Of course we have no way of knowing how long Facebook has been planning these features, but the timing and similarity to Google+ features certainly makes it appear to be a copycat response to the new Google+ threat. Facebook rolls these features out over time (and without warning), so they may not be on your account yet, but they will be. The two features are interlinked, in what appears to be an attempt to make Facebook “friend lists” be more like Google+ “circles”. This change started to roll out a few weeks ago and now appears to be site wide, applying to all accounts. The status box used to update your status got a few new controls and widgets. First, on the left are two new options. The “who are you with” button lets you tag people in your status update. The second widget adds location to the status. Ok, fine. But the biggest change is the drop down on the right, next to the “Post” button. This lets you set who the status update goes to (sort of). The normal option (the way Facebook has always worked) would be the “Friends” choice, meaning the status update is seen by your friends only. If you specify “Public” your status is visible to anyone, basically making Facebook more like Twitter, where if you want to, you can publish your status updates for anyone to see. Bringing us to another new feature (described further below) where people that are not your friends, can “subscribe” to your public updates, again, more or less the way Twitter works. I think by default, Facebook has made the new default “Public,” so if you don’t change that, your status updates will be visible to everyone. 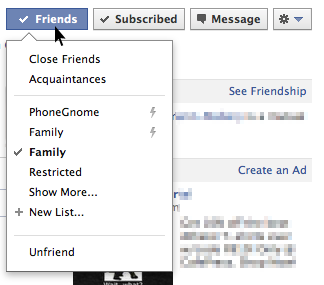 In addition to the “Public” and “Friends” options, you can now specify that an update should only be sent to friends on a specific list, one of your old “friend lists” (if you ever used that feature) or one of the new “automatic” lists that Facebook calls “Smart Lists,” which are managed by Facebook automatically for you based on profile information – another case of Facebook telling us “trust us, we know what you want.” Time will tell whether people find these automatic lists useful and trustworthy. The new “Friends” widget shown above makes it easier to manage the lists a given friend is on. Every time you visit their profile, you can check or change what lists they are on. For anyone that suffered through the old cumbersome way of managing lists this is much easier than before, but there is still plenty of room for improvement. There’s also the new “Subscribed” button, which allows you to subscribe to a person’s “Public” updates, so that any status updates they mark as “Public” will show up on your page, even if they are not your friend. This is clearly a case where Facebook wants to be like Twitter. These new changes are mostly being heralded around the net and in the media as a brilliant move by Facebook. Technically, for being obviously bolted-on, I have to admit they are not that terrible, in terms of the implementation. But here’s where I wonder if Facebook might be shooting themselves in the foot here, and actually helping Google+ (especially) and Twitter (to a lesser degree) which is probably not their intent. Google+ is too complicated and too geek-oriented. When people share something with Google+, they are going to constantly find themselves asking “who is that going to?” Twitter suffers from being too confusing to people too. But if Twitter is too complicated, Google+ is going to be like a third-semester Calculus class for many people. Only a tiny fraction of Twitter users ever figure out how to effectively manage notifications or “who sees what” on Twitter. Google+ hasn’t made it any easier. If people are overwhelmed and confused with the Twitter options, their brains are going to explode with Google+. With Facebook now essentially copying the Google+ “circles” model, they have now introduced the same kind of complexity into Facebook that hinders their competitors, effectively removing a major differentiator of Facebook: being easy to understand for mainstream users. Facebook has just done Google a huge favor. In essence, by force feeding this change to its 750 million users, Facebook will be doing something Google themselves may have spent years doing: teaching them how Google+ works. Facebook users have no choice but to accept these new features, and struggle to learn them, which will make all Facebook users more comfortable with the “circles” model, and that level of complexity, ultimately making it that much less painful to switch to Google+. Before this, if a Facebook user went to Google+, they had to figure out how “circles” and selective sharing work using Google+ itself. Google+ would be their first exposure to this mode of operating. They would have no mental model for it and no prior experience with the ideas of it. Now, a Facebook user will have a direct analog from their Facebook experience – as soon as they hit Google+ they will already have an idea how “circles” and selective sharing work, removing a huge switching barrier. Likewise, with the new “Public” and “Subscribe” features, Facebook is teaching those 750 million users how Twitter works too, something Twitter themselves has been largely unable to do. However, I think in this case, Twitter is the loser and Facebook the winner (more on that in a separate post). But Google+, on the other hand, just got handed an enormously valuable gift by Facebook. 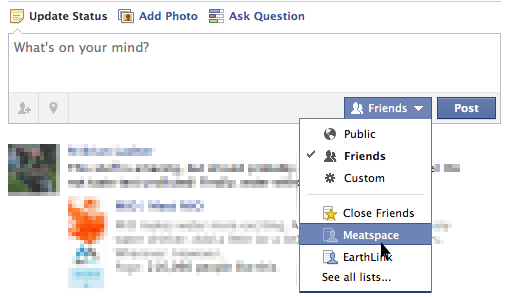 Selective sharing and maintaining lists is how I have been using FB (those little time I use), even before G+. Since they introduced the List feature six months (late 2007) after I did in my application, I was curious to evaluate it and it just stuck.